Download "White Paper March 2009. 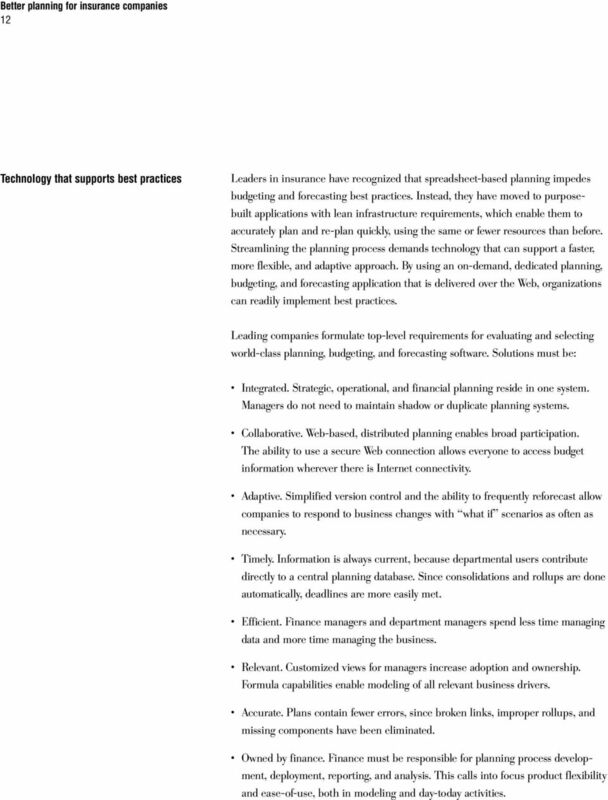 Better planning for insurance companies Technology and best practices for profitability management"
2 2 Contents 3 Business problems Planning challenges Supporting best practices 8 Business Drivers Model business drivers Manage content that is material Timeliness and reliability Best-practice templates 10 The Solution The IBM Cognos Insurance Product Performance Blueprint New methods to address current challenges Set and monitor targets that improve profitability Technology that supports best practices Planning software selection matrix 16 Conclusion Selecting the right planning software Abstract In an increasingly competitive marketplace, complicated by industry globalization, escalating and emerging risks, and regulatory pressures, insurance companies can no longer afford business as usual. Nor can insurance companies continue to rely on investment income alone. They must improve their business processes, not only to stay competitive, but also to deal with an increasingly complex market. Insurance executives need visibility into every facet of the business underwriting and rating, claims, marketing, distribution management, portfolio risk management, and more to make the right decisions. Each of these many day-to-day business decisions need to be made in context with the financial goals and objectives. However, for an industry saddled with aging legacy systems and manual paper-based processes, good decisions can be elusive. Overview The enterprise planning process planning, budgeting, forecasting, and reporting is a crucial component of better visibility. Yet, despite its importance to a company s financial well-being, planning is often back-burnered because it is seen as burdensome and time-consuming. 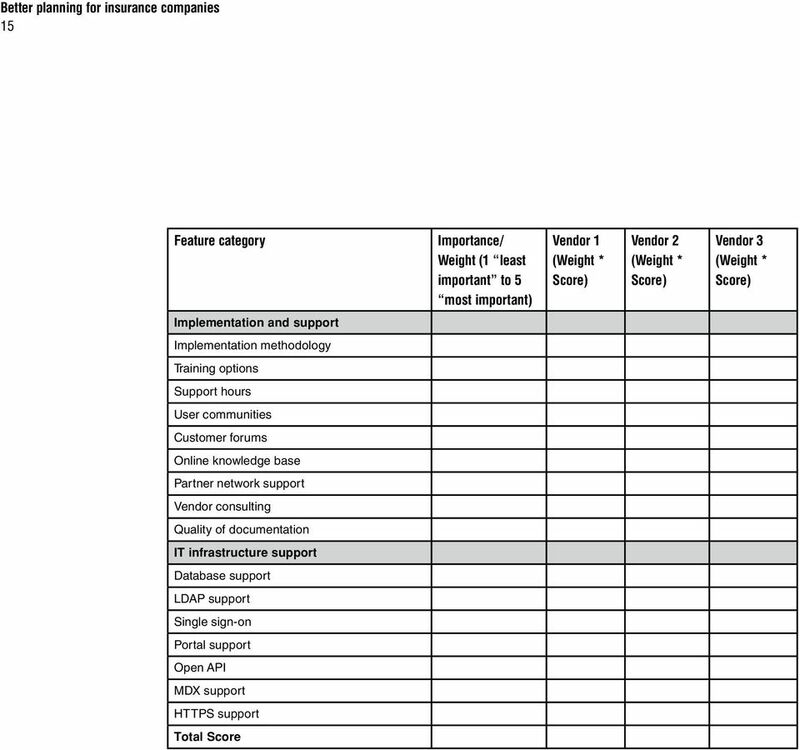 The other issue is that these paper of spreadsheet plans rarely get connected to the day-to-day business decisions being made across the company. Strategic planning and forecasting is typically an annual event, often based on prior year results rather than on business drivers, and is typically done in isolation by product line, business segment, branch, or region without considering the overall business impact. Therein lies an opportunity for the forward-thinking organization. 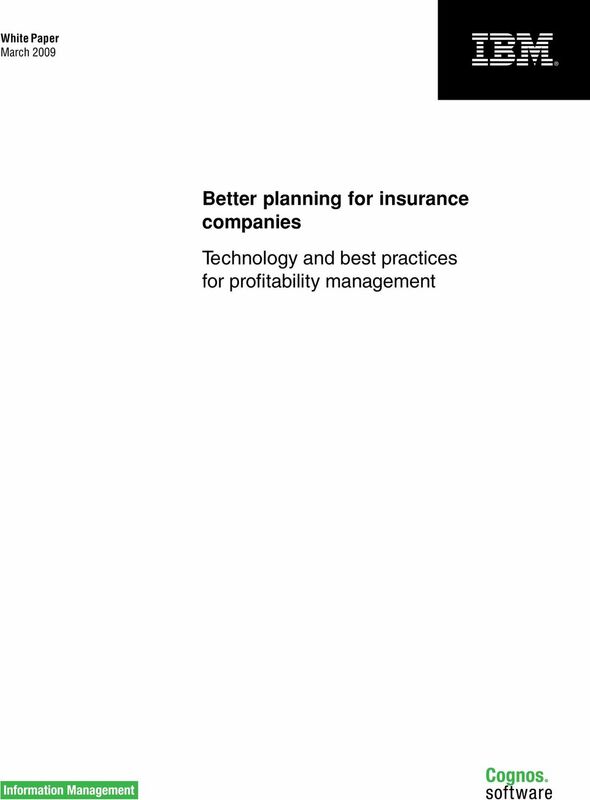 Leading insurance companies are seizing the opportunity to improve profitability management by leveraging new technologies and employing best practices in planning, budgeting, and forecasting, and then connecting them to the business of insurance. They are rewarded with more accurate plans, timely forecasts, and effective decision-making. Overall, they save time, reduce errors, improve collaboration enterprise-wide, and foster a disciplined financial management culture that delivers true competitive advantage. 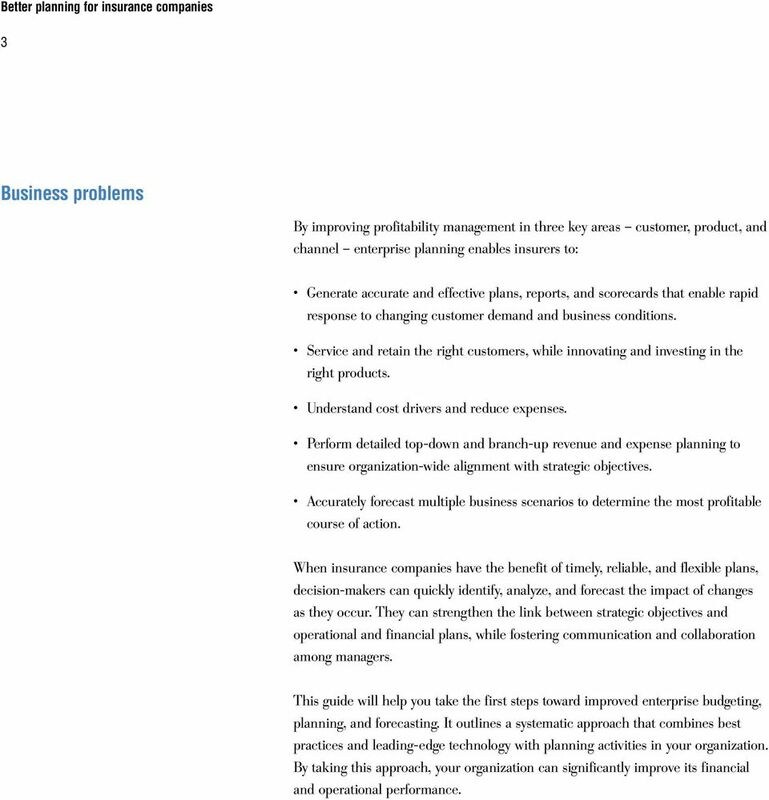 3 3 Business problems By improving profitability management in three key areas customer, product, and channel enterprise planning enables insurers to: Generate accurate and effective plans, reports, and scorecards that enable rapid response to changing customer demand and business conditions. Service and retain the right customers, while innovating and investing in the right products. Understand cost drivers and reduce expenses. Perform detailed top-down and branch-up revenue and expense planning to ensure organization-wide alignment with strategic objectives. Accurately forecast multiple business scenarios to determine the most profitable course of action. When insurance companies have the benefit of timely, reliable, and flexible plans, decision-makers can quickly identify, analyze, and forecast the impact of changes as they occur. They can strengthen the link between strategic objectives and operational and financial plans, while fostering communication and collaboration among managers. This guide will help you take the first steps toward improved enterprise budgeting, planning, and forecasting. It outlines a systematic approach that combines best practices and leading-edge technology with planning activities in your organization. By taking this approach, your organization can significantly improve its financial and operational performance. 4 4 Planning challenges In insurance, corporate decision-makers typically voice similar frustrations with regard to planning, budgeting, and forecasting: Processes are tedious and time-consuming. Changes are difficult to implement. Data integrity is questionable. Explanation of variances is difficult. For managers outside finance, planning can be perceived as little more than a periodic invasion of their time with minimal benefit. Managers can feel besieged by demands for information and improved projections, while still being expected to deliver results. 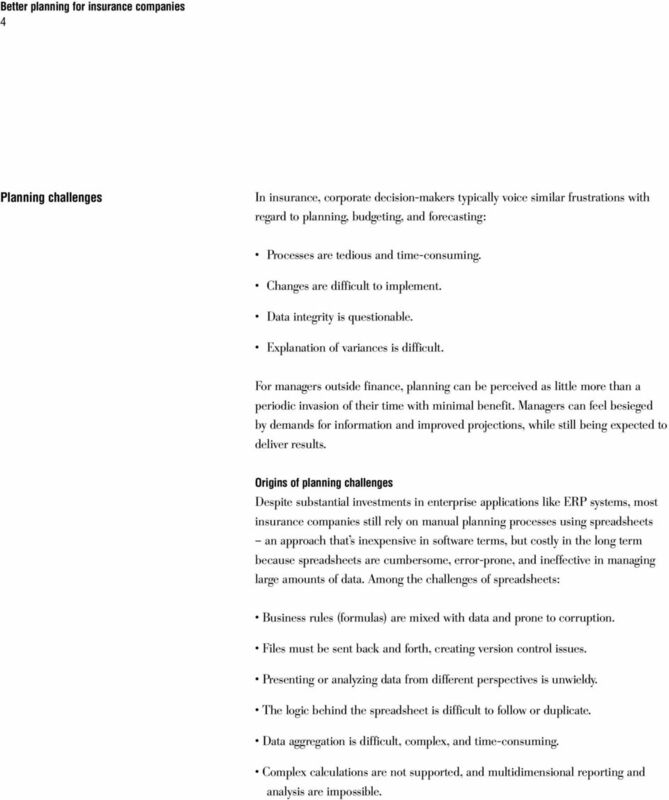 Origins of planning challenges Despite substantial investments in enterprise applications like ERP systems, most insurance companies still rely on manual planning processes using spreadsheets an approach that s inexpensive in software terms, but costly in the long term because spreadsheets are cumbersome, error-prone, and ineffective in managing large amounts of data. Among the challenges of spreadsheets: Business rules (formulas) are mixed with data and prone to corruption. Files must be sent back and forth, creating version control issues. Presenting or analyzing data from different perspectives is unwieldy. The logic behind the spreadsheet is difficult to follow or duplicate. Data aggregation is difficult, complex, and time-consuming. Complex calculations are not supported, and multidimensional reporting and analysis are impossible. 5 5 Supporting best practices Insurance companies struggle with profitability management not because of a lack of information, but rather an inability to identify, present, and act upon the right information at the right time. 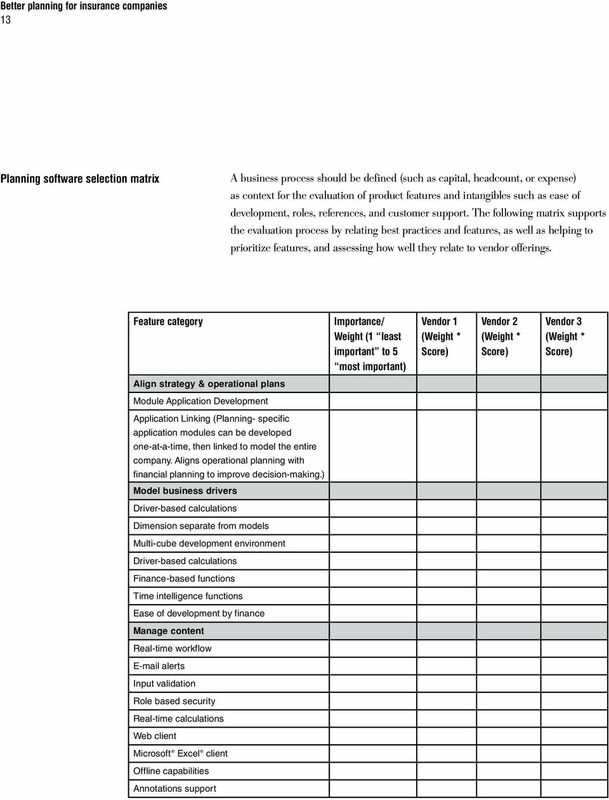 Planning software should support best practices to enhance timeliness, information reliability, and participation by key people across the enterprise. Align strategic and operating plans The ongoing alignment of strategic and operating plans is vital. Finance must clearly communicate corporate strategic plans to those who run the day-to-day business. Finance can help translate strategic goals into financial targets and then into specific departmental or branch-level plans and related revenue and expense drivers, such as headcount and equipment. 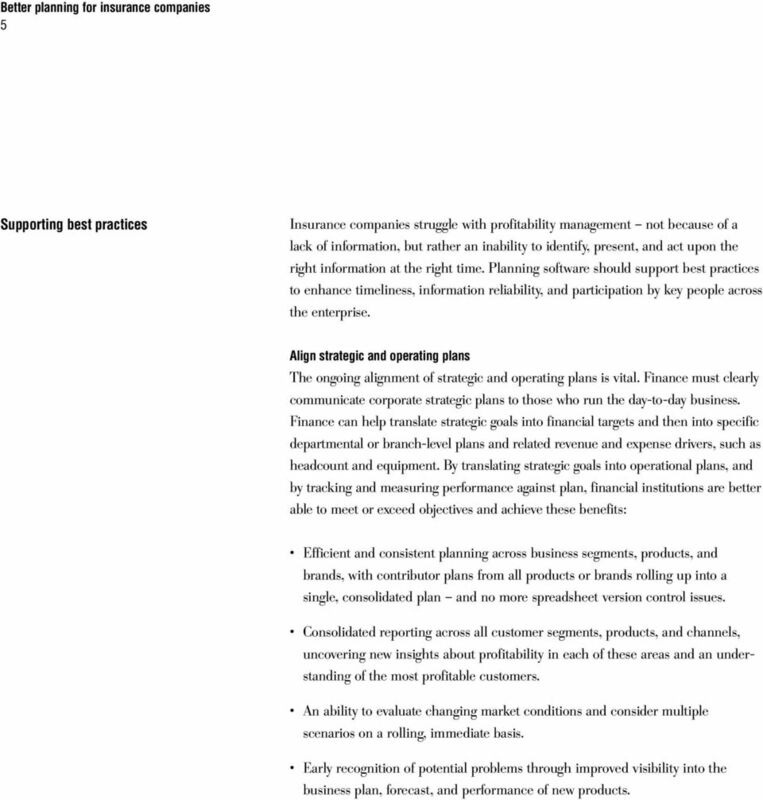 By translating strategic goals into operational plans, and by tracking and measuring performance against plan, financial institutions are better able to meet or exceed objectives and achieve these benefits: Efficient and consistent planning across business segments, products, and brands, with contributor plans from all products or brands rolling up into a single, consolidated plan and no more spreadsheet version control issues. Consolidated reporting across all customer segments, products, and channels, uncovering new insights about profitability in each of these areas and an understanding of the most profitable customers. An ability to evaluate changing market conditions and consider multiple scenarios on a rolling, immediate basis. Early recognition of potential problems through improved visibility into the business plan, forecast, and performance of new products. 6 6 Start at the top and at the bottom An important ingredient in successful budgeting and forecasting is the ability to align top-down financial targets with bottom-up plans. Some companies establish top-down targets and then turn the annual budgeting process over to finance, along with a mandate to meet those numbers. Other companies require detailed bottom-up planning, and then plug the total company numbers in at the top, so that the plan meets strategic targets. Neither of these approaches reflects a commitment to planning excellence. Instead, insurance companies should provide initial guidance from senior management s top-down perspective on strategic goals, objectives, and expectations. 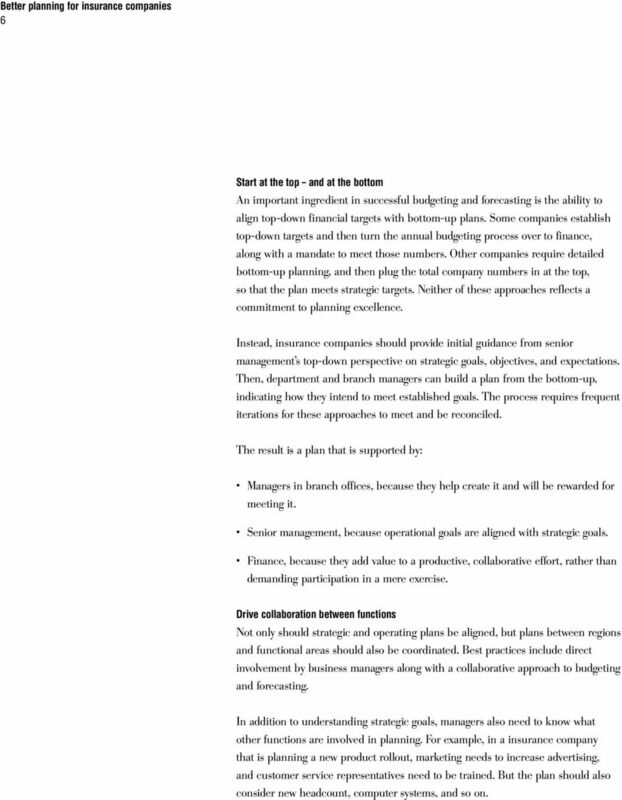 Then, department and branch managers can build a plan from the bottom-up, indicating how they intend to meet established goals. The process requires frequent iterations for these approaches to meet and be reconciled. The result is a plan that is supported by: Managers in branch offices, because they help create it and will be rewarded for meeting it. Senior management, because operational goals are aligned with strategic goals. Finance, because they add value to a productive, collaborative effort, rather than demanding participation in a mere exercise. Drive collaboration between functions Not only should strategic and operating plans be aligned, but plans between regions and functional areas should also be coordinated. Best practices include direct involvement by business managers along with a collaborative approach to budgeting and forecasting. In addition to understanding strategic goals, managers also need to know what other functions are involved in planning. For example, in a insurance company that is planning a new product rollout, marketing needs to increase advertising, and customer service representatives need to be trained. But the plan should also consider new headcount, computer systems, and so on. 7 7 Such collaborative planning can be accomplished through an iterative process that lets managers forecast and share alternative scenarios. Finance also plays a key role in facilitating the coordination of plans across the company, which helps ensure that operational tactics are aligned with financial targets throughout the organization. Adapt to changing business conditions Insurance companies need to adjust plans, metrics, and resource allocations in response to market and internal variability. For example, changes in interest rates may reduce loan volumes, which in turn may lead to excess headcount from hiring during peak times; visibility into metrics such as revenue per employee allows insurance institutions to make prudent staffing decisions. In response to these variable conditions, dynamic re-forecasting is required: Frequent Re-forecasting. Forecasting may be needed monthly or even bi-weekly especially in fast-moving, quickly growing business segments with multiple market pressures. Continual re-forecasting helps managers answer critical questions such as, What did we expect? How are we doing against our plan? and even more importantly, How should we adapt our plans going forward? Rolling Forecasts. Organizations running rolling forecasts are always looking to the immediate or near-term future. For them, business does not end on December 31st and restart on January 1st. The forecast timeframe should extend out two to eight quarters, depending on business volatility. Planning should be an ongoing process with frequent opportunities for managers to view the company s latest internal and external performance data. They should be able to alter plans based on new information coming from sources such as other managers, monthly actuals, and top-down target revisions. Finance should be able to quickly consolidate plan data from all areas of the company, and to disseminate new information in real time. This process will facilitate more informed decision-making in such areas as market trends, pricing changes, capital allocations, or organizational changes. 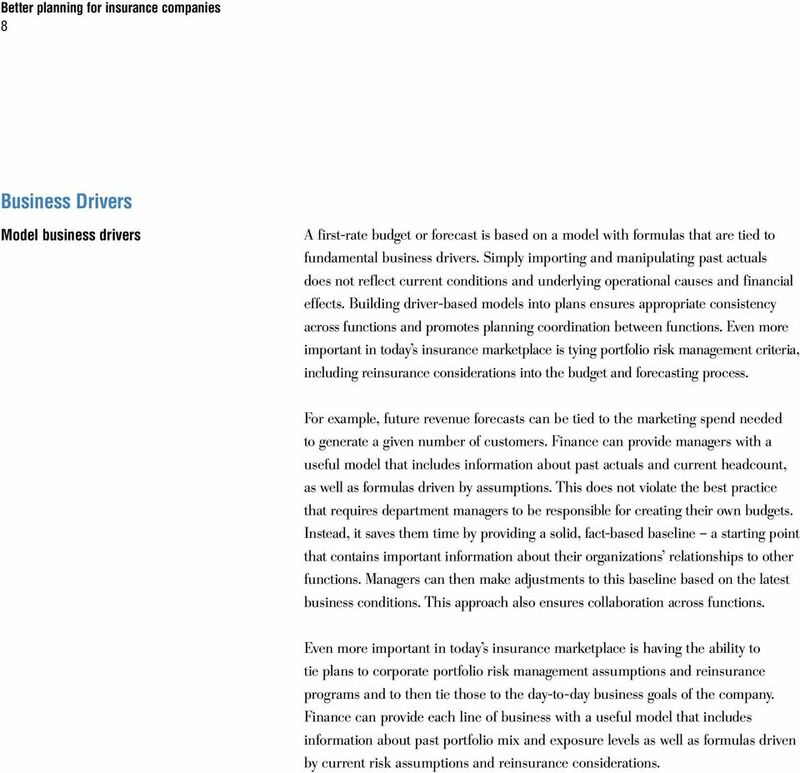 8 8 Business Drivers Model business drivers A first-rate budget or forecast is based on a model with formulas that are tied to fundamental business drivers. Simply importing and manipulating past actuals does not reflect current conditions and underlying operational causes and financial effects. Building driver-based models into plans ensures appropriate consistency across functions and promotes planning coordination between functions. Even more important in today s insurance marketplace is tying portfolio risk management criteria, including reinsurance considerations into the budget and forecasting process. For example, future revenue forecasts can be tied to the marketing spend needed to generate a given number of customers. Finance can provide managers with a useful model that includes information about past actuals and current headcount, as well as formulas driven by assumptions. This does not violate the best practice that requires department managers to be responsible for creating their own budgets. Instead, it saves them time by providing a solid, fact-based baseline a starting point that contains important information about their organizations relationships to other functions. Managers can then make adjustments to this baseline based on the latest business conditions. This approach also ensures collaboration across functions. Even more important in today s insurance marketplace is having the ability to tie plans to corporate portfolio risk management assumptions and reinsurance programs and to then tie those to the day-to-day business goals of the company. Finance can provide each line of business with a useful model that includes information about past portfolio mix and exposure levels as well as formulas driven by current risk assumptions and reinsurance considerations. 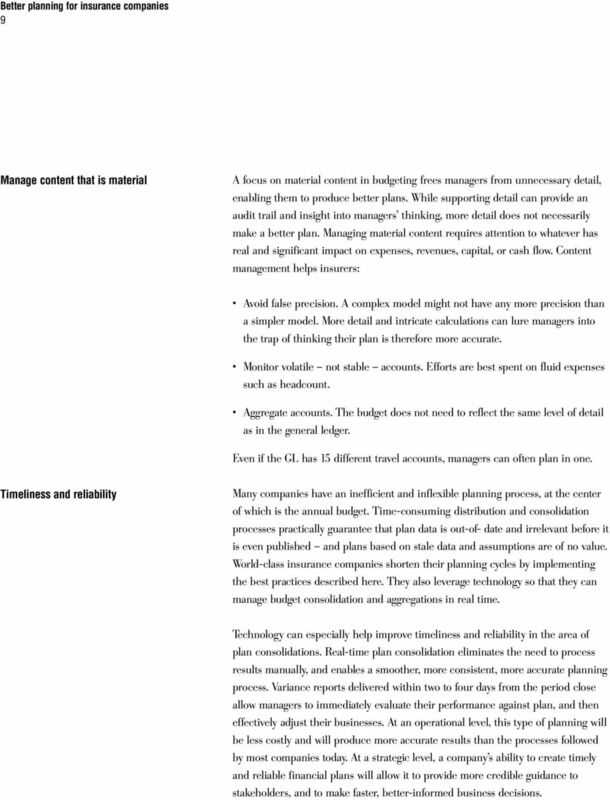 9 9 Manage content that is material A focus on material content in budgeting frees managers from unnecessary detail, enabling them to produce better plans. While supporting detail can provide an audit trail and insight into managers thinking, more detail does not necessarily make a better plan. Managing material content requires attention to whatever has real and significant impact on expenses, revenues, capital, or cash flow. Content management helps insurers: Avoid false precision. A complex model might not have any more precision than a simpler model. More detail and intricate calculations can lure managers into the trap of thinking their plan is therefore more accurate. Monitor volatile not stable accounts. Efforts are best spent on fluid expenses such as headcount. Aggregate accounts. The budget does not need to reflect the same level of detail as in the general ledger. Even if the GL has 15 different travel accounts, managers can often plan in one. Timeliness and reliability Many companies have an inefficient and inflexible planning process, at the center of which is the annual budget. Time-consuming distribution and consolidation processes practically guarantee that plan data is out-of- date and irrelevant before it is even published and plans based on stale data and assumptions are of no value. World-class insurance companies shorten their planning cycles by implementing the best practices described here. They also leverage technology so that they can manage budget consolidation and aggregations in real time. Technology can especially help improve timeliness and reliability in the area of plan consolidations. Real-time plan consolidation eliminates the need to process results manually, and enables a smoother, more consistent, more accurate planning process. Variance reports delivered within two to four days from the period close allow managers to immediately evaluate their performance against plan, and then effectively adjust their businesses. At an operational level, this type of planning will be less costly and will produce more accurate results than the processes followed by most companies today. At a strategic level, a company s ability to create timely and reliable financial plans will allow it to provide more credible guidance to stakeholders, and to make faster, better-informed business decisions. 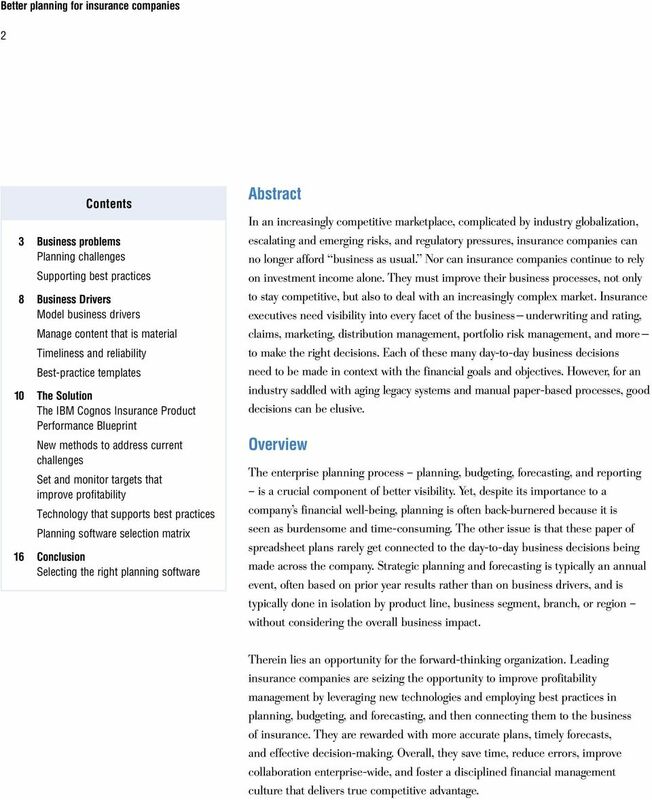 10 10 Best-practice templates The use of pre-built, best-practice templates or planning models can help organizations reduce implementation risk and accelerate time to business value. They are being developed by software vendors for a wide range of functional areas and industries. With templates, companies can establish dynamic connections that keep strategic objectives, operational plans, people, and initiatives in sync as business conditions change. Executives can quickly see the impact of changes in operational plans on corporate financials. Regional and branch managers can quickly adjust resource allocations to support corporate objectives. And corporate guidelines and policies are more consistently communicated and applied throughout the business. 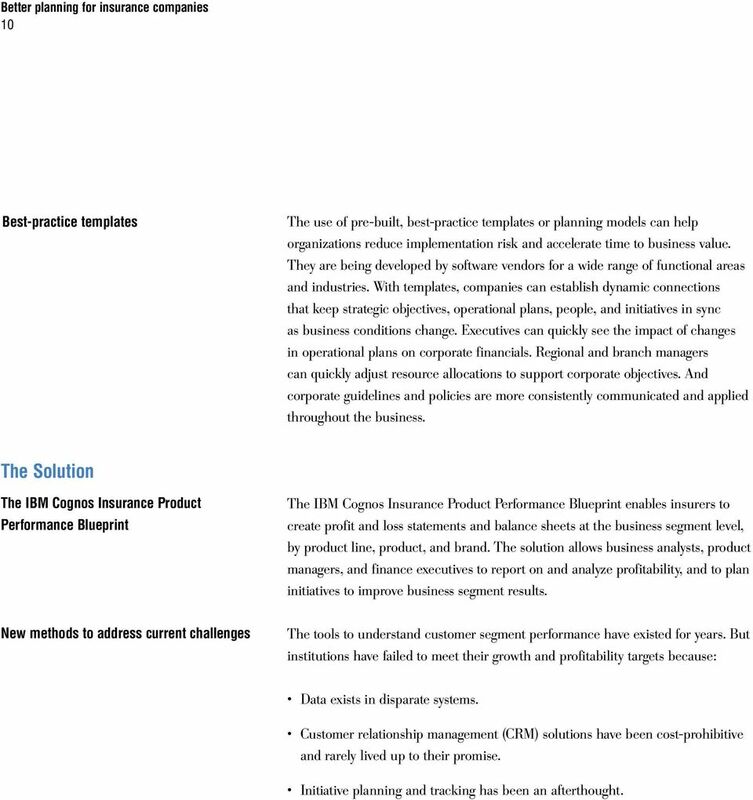 The Solution The IBM Cognos Insurance Product Performance Blueprint The IBM Cognos Insurance Product Performance Blueprint enables insurers to create profit and loss statements and balance sheets at the business segment level, by product line, product, and brand. The solution allows business analysts, product managers, and finance executives to report on and analyze profitability, and to plan initiatives to improve business segment results. New methods to address current challenges The tools to understand customer segment performance have existed for years. But institutions have failed to meet their growth and profitability targets because: Data exists in disparate systems. Customer relationship management (CRM) solutions have been cost-prohibitive and rarely lived up to their promise. Initiative planning and tracking has been an afterthought. 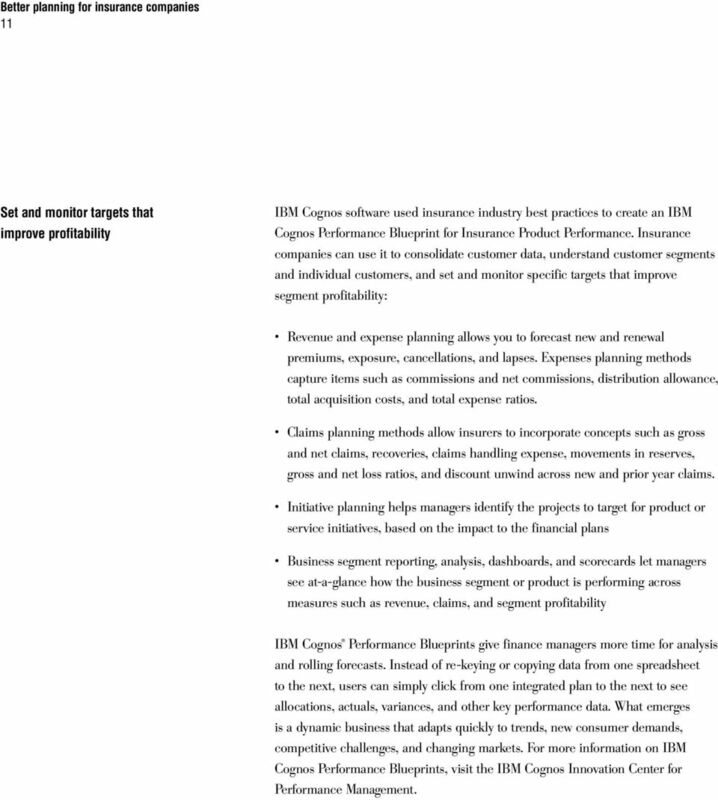 11 11 Set and monitor targets that improve profitability IBM Cognos software used insurance industry best practices to create an IBM Cognos Performance Blueprint for Insurance Product Performance. Insurance companies can use it to consolidate customer data, understand customer segments and individual customers, and set and monitor specific targets that improve segment profitability: Revenue and expense planning allows you to forecast new and renewal premiums, exposure, cancellations, and lapses. Expenses planning methods capture items such as commissions and net commissions, distribution allowance, total acquisition costs, and total expense ratios. Claims planning methods allow insurers to incorporate concepts such as gross and net claims, recoveries, claims handling expense, movements in reserves, gross and net loss ratios, and discount unwind across new and prior year claims. Initiative planning helps managers identify the projects to target for product or service initiatives, based on the impact to the financial plans Business segment reporting, analysis, dashboards, and scorecards let managers see at-a-glance how the business segment or product is performing across measures such as revenue, claims, and segment profitability IBM Cognos Performance Blueprints give finance managers more time for analysis and rolling forecasts. Instead of re-keying or copying data from one spreadsheet to the next, users can simply click from one integrated plan to the next to see allocations, actuals, variances, and other key performance data. What emerges is a dynamic business that adapts quickly to trends, new consumer demands, competitive challenges, and changing markets. 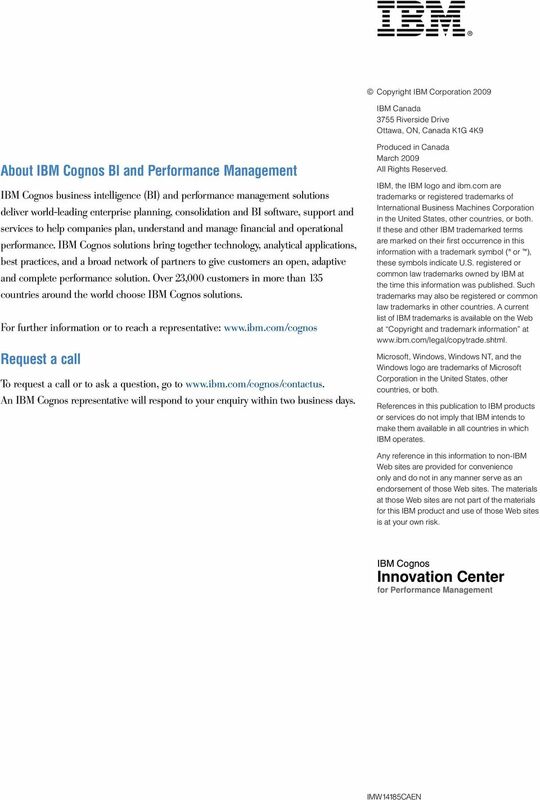 For more information on IBM Cognos Performance Blueprints, visit the IBM Cognos Innovation Center for Performance Management. 12 12 Technology that supports best practices Leaders in insurance have recognized that spreadsheet-based planning impedes budgeting and forecasting best practices. Instead, they have moved to purposebuilt applications with lean infrastructure requirements, which enable them to accurately plan and re-plan quickly, using the same or fewer resources than before. Streamlining the planning process demands technology that can support a faster, more flexible, and adaptive approach. By using an on-demand, dedicated planning, budgeting, and forecasting application that is delivered over the Web, organizations can readily implement best practices. Leading companies formulate top-level requirements for evaluating and selecting world-class planning, budgeting, and forecasting software. Solutions must be: Integrated. Strategic, operational, and financial planning reside in one system. 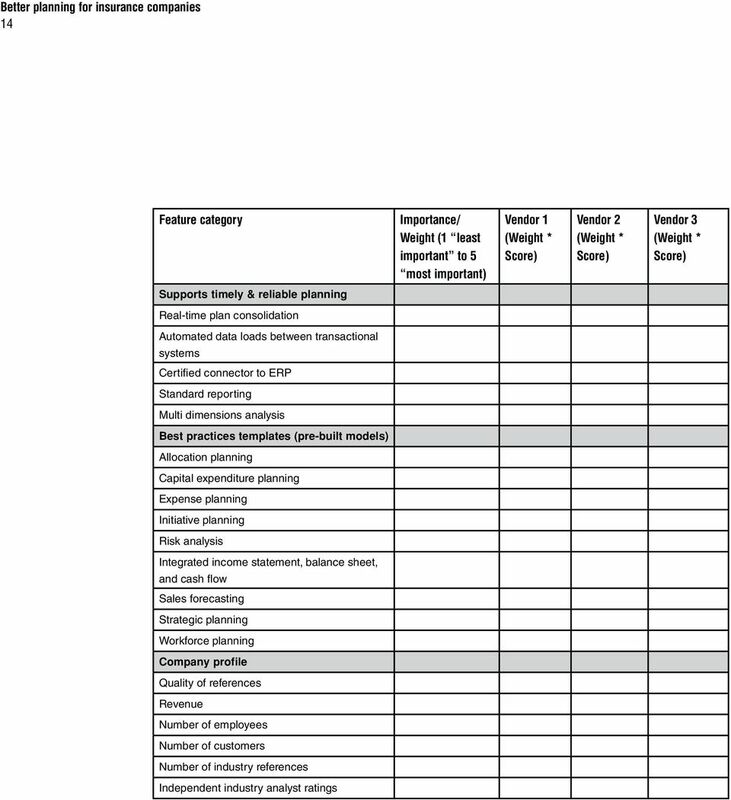 Managers do not need to maintain shadow or duplicate planning systems. Collaborative. Web-based, distributed planning enables broad participation. The ability to use a secure Web connection allows everyone to access budget information wherever there is Internet connectivity. Adaptive. Simplified version control and the ability to frequently reforecast allow companies to respond to business changes with what if scenarios as often as necessary. Timely. Information is always current, because departmental users contribute directly to a central planning database. Since consolidations and rollups are done automatically, deadlines are more easily met. Efficient. Finance managers and department managers spend less time managing data and more time managing the business. Relevant. Customized views for managers increase adoption and ownership. Formula capabilities enable modeling of all relevant business drivers. Accurate. Plans contain fewer errors, since broken links, improper rollups, and missing components have been eliminated. Owned by finance. Finance must be responsible for planning process development, deployment, reporting, and analysis. This calls into focus product flexibility and ease-of-use, both in modeling and day-today activities. 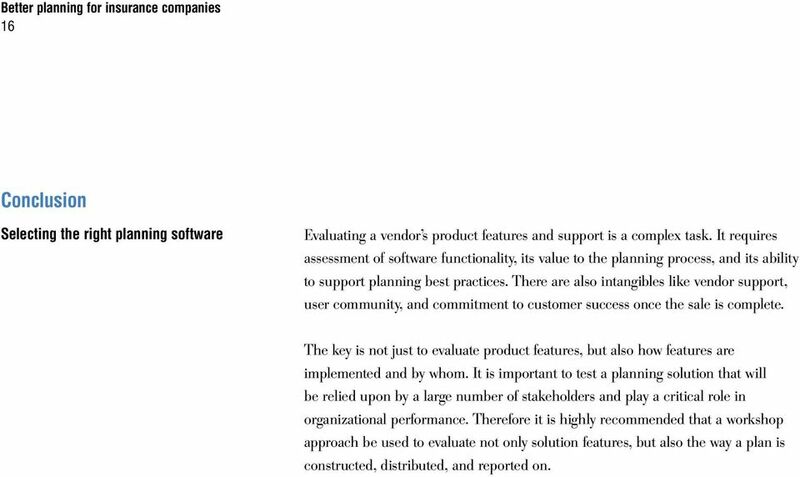 16 16 Conclusion Selecting the right planning software Evaluating a vendor s product features and support is a complex task. It requires assessment of software functionality, its value to the planning process, and its ability to support planning best practices. There are also intangibles like vendor support, user community, and commitment to customer success once the sale is complete. The key is not just to evaluate product features, but also how features are implemented and by whom. It is important to test a planning solution that will be relied upon by a large number of stakeholders and play a critical role in organizational performance. Therefore it is highly recommended that a workshop approach be used to evaluate not only solution features, but also the way a plan is constructed, distributed, and reported on. Successful strategy flows from accurate, timely and collaborative knowledge.